For the fifth consecutive year the Friends of Scotchman Peaks Wilderness has received a challenge grant from the Cinnabar Foundation. We are grateful for their continued confidence and support! This year they have awarded us a $4,000 Challenge Grant. 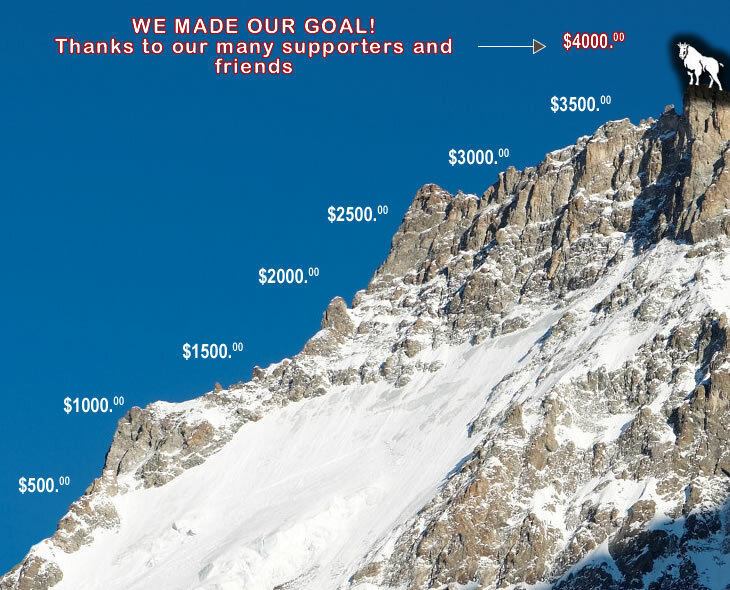 If we are able to raise $4,000 from our supporters, we will receive that amount from Cinnabar, resulting in $8,000 to support our outreach efforts. We have met the challenge in each of the last four years. So if you are considering a contribution to the Friends of Scotchman Peaks to assist us in our efforts to protect the Scotchman Peaks as Wilderness, then this is the perfect time to send in that contribution! Your individual contribution, no matter how large or small, makes a big difference. Any amount helps. In fact, small contributions from as a large number of people not only helps to spread the support around, it helps to show that a large community is actively involved and support the designation of the Scotchman Peaks as Wilderness. Your contribution will help us protect the Scotchman Peaks, for our families, for tomorrow. We would like to raise this money by October 1st, but the sooner we reach our goal of $4,000 in individual contributions, the sooner we will benefit from Cinnabar’s match – so, don’t delay! 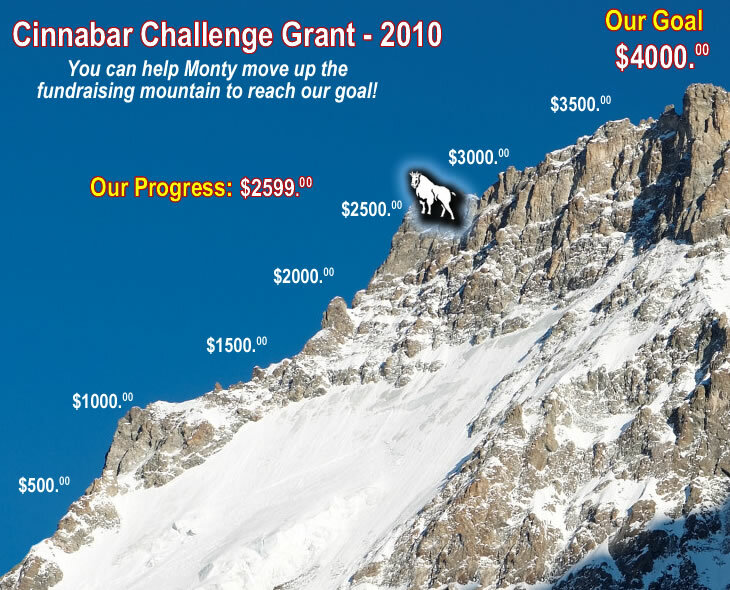 You can follow our progress by clicking on our Fundraiser Progress Graphic. The Cinnabar Foundation was created over 25 years ago by Montanan’s Len and Sandy Sargent and is Montana’s own home grown conservation fund. The Foundation awards grants to groups like ours, crusading to protect Montana and the Greater Yellowstone ecosystem. The Sargent legacy lives through the work that we are doing, and we believe they would be proud of our efforts to protect the Scotchmans. 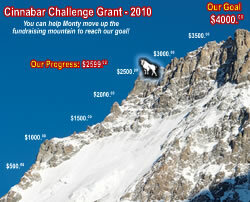 Check back here to monitor our progress in achieving this matching grant, and watch our goat climb that mountain! We are excited to announce that the Friends of Scotchman Peaks Wilderness has been awarded a $5,000 “Challenge” grant by the Cinnabar Foundation!! In order to receive these funds we need your help to raise matching contributions. The sooner we raise the matching funds the sooner that Cinnabar will release the grant money and the more effective our campaign will be. Your 2006 donation will allow us to receive this matching grant, which will provide significant help to us in continuing these programs and publications. We hope to reach our goal of matching donations by Oct 1st, sooner if possible. 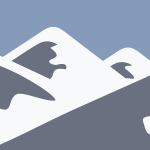 ·	More than 700 people have signed up to become a Friend of Scotchman Peaks Wilderness and support wilderness designation for this special place. ·	Recommended Wilderness for the Scotchmans has been endorsed by: the Idaho Native Plant Society, the Governor of Montana, the Mayor of Sandpoint, the Bonner County Commissioners, the Sandpoint City Council, the Ponderay City Council, the Sanders County Ledger and the River Journal. ·	We have printed and distributed free of charge newspaper inserts, booklets and brochures to thousands of potential supporters. ·	We have set up a comprehensive website introducing a wide audience to our special corner of the Inland Northwest. ·	We have produced a bi-monthly newsletter with the information and inspiration needed to create wilderness. ·	We have led dozens of hikes to introduce people to the wonder of the Scotchmans. ·	Through presentations to civic groups and media relations we have helped to spread knowledge of the benefits wilderness protections can bring. 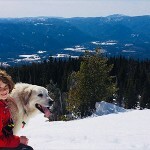 ·	We have helped to develop programs for students from Gonzaga University to become involved in supporting the campaign for wilderness protection for the Scotchmans. ·	We have monitored the Idaho Panhandle and Kootenai Forest plan revision process and forest service projects, which affect the Scotchmans.